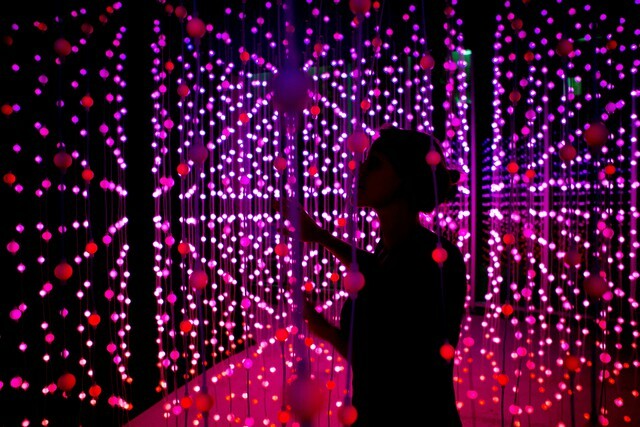 An interactive façade to directly engage the general public, suggesting new ways of seeing, feeling and experiencing one’s own perception of one`s self. Exploring the installation, people can feel how the personal scale is expanded to the architectural scale. 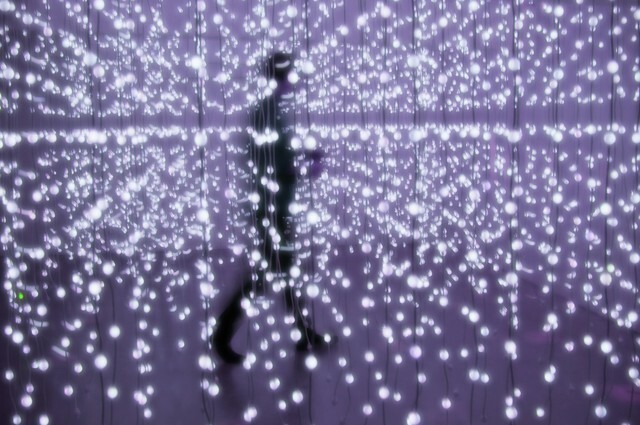 The result is an awe-inspiring experience of light, sound, speed and generative architecture that is directly related to one’s own body movements. The installation consists of three main parts; the 3D façade canvas with 6 layers of LEDs (covering 50 x 19 x 1.2 meters), the interactive LED outdoor podium (1.7 x 1.5 meters) with multi-touch sensors and the interactive and lighting control systems. A slanting monolithic podium rises seamlessly from the plaza’s stonework, an array of Sensacell LED panels are diffused to provide an inviting but impressive representation of the façade at a human scale. Multi-touch electrostatic sensors detect a presence on the podium. A network of interactive servers remotely process the live input data, returning the interactive content simultaneously to the façade and back to the podium LEDs. The public facing podium has a direct visual relationship with the façade creating an impressive but unifying experience. Stereo speakers flank the slanting podium, which delineates the space for expression. The podium senses 3D depth and provides a touch-less interface that transmits body movements, via live interactive programming, onto the 3D façade. Each interactive show is based on natural phenomena that are designed to evoke a childlike engagement in adults; one forms a personal relationship with the experience that arises different emotions in different people. Each show has a unique interface that intuitively steers you to express yourself. Much like a musical instrument, people generate their own composition but smart algorithms are working in the background ensuring a beautiful encounter. There is no option but to be playful. One can push aside Rain, ignite explosive fireworks or touch the Aurora Borealis. Our aim is to breakdown people’s mental barriers, opening them up to participate by exposing them to the creative process. Ultimately all the technology is designed to become transparent, leaving only a magical experience and feelings evoked by the encounter. Facade type and geometry (structure) : Composed by three layers, the first is the reflective glass curtain wall, the second is an iron structure that allows to walk between the first and third layer for maintenance. The third consists of 532 iron poles named "needles" perpendicular to the façade. It is the principle structure of the 3D mesh formed with 2570 units of a custom 10 LED strips. The 3D Mesh formed a 19 x 28 grid. 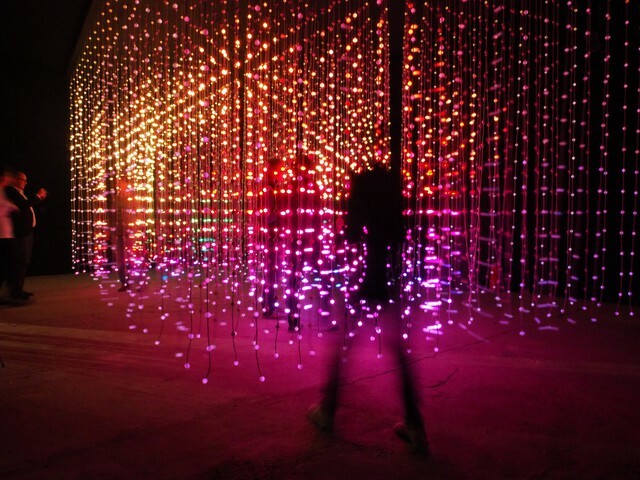 Kind of light creation : The façade design consists of six layers of LEDs, brighter nodes in the first layer and finer points of light in the next five layers of LEDs. Two deliberate grids; one bright, bold and sparse for dramatic moments, the other concentrated and subtle for nuanced sculptural effects. The content has been designed to take advantage of this optical illusion, producing beautiful interactive effects. Resolution and transmitting behaviour : Low resolution- 25.650 RGB pixels, in the first 5 layers, with nodes of 1.5 watts each. The 6th layer has 532 pixels of 25 watts each. This façade runs in two modes, interactive and standalone. In both modes, the grid makes organic movements that transforms the façade of the building every night. Luminace : The façade is only lit up at night with a specific schedule. Interactive from 6 pm to 10 pm, standalone mode from 10 pm to 1 am. In the weekends the interactive mode could run from 6pm to 1 am. The interactive shows and standalone shows are designed contrasting the high brightness and lower brightness, dimming the lights to create organic effects, shadows and perspective in the content. Urban situation : Situated on a busy junction and visible across the city skyline. It stands out as a visual icon contributing to everyone’s experience regardless of their distance. The project is a public artwork intervention that contributes to the wider urban fabric. Such key spaces could become a highlight for the extraordinary, as well as places for social participation. Description of showreel : The different shows provide a canvas for emotional expression and experience. 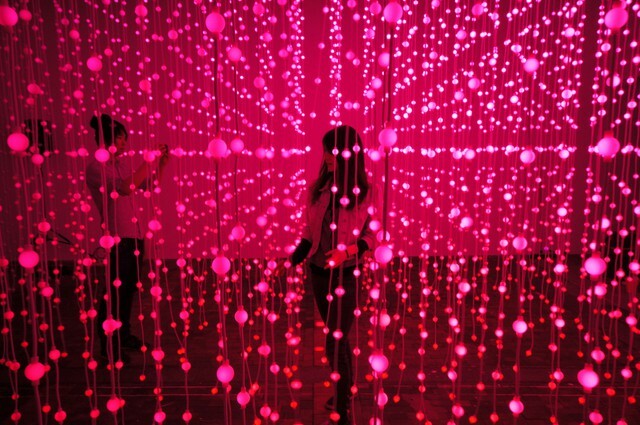 The installation gives people magical powers to create situations that are normally reserved for fantasy. 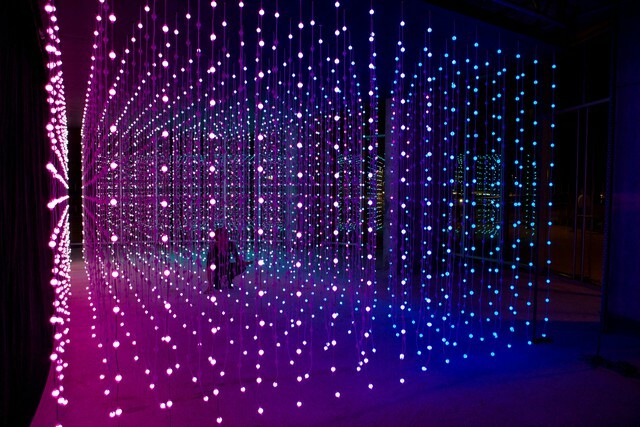 The ‘Magic Dust’ allows you to throw and push luminescent particles through the façade with glittering sound effects. While with ‘Rain’, you can part the shower of light like with an umbrella. ‘Sand’ is in an organic manipulation of the façade, where shadow and form drift as dunes, followed by the sounds of the wind and shifting sands. ‘Stars’ provide the remarkable opportunity to dream up your own constellations in the middle of a bright city, each star appearing with an accoustic chime. ‘Aurora’ provides the opportunity to touch ephemeral strands of plasma, the supernatural becomes tangible together with harmonic resonances. ‘Fireworks’ provides the opportunity to initiate spontaneous bursts of sparkles and colour, whistling rockets rush upwards in the background with explosions in the foreground. ‘Ripple’ is a melody of piano notes that generates psychedelic oil drops which collide and mix into new compositions. ‘Light Orchestra’ transforms the building into a musical instrument of violins and cellos, allowing the public to compose their own symphony.